Please pull into our yard and we will get you the materials you need. 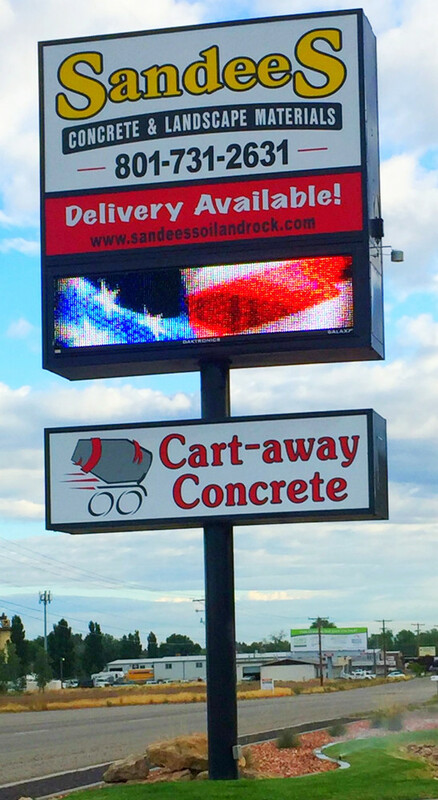 Our portable concrete carts will help you save both time and money, without compromising on a professional, high quality finish. We pride ourselves on our clean environment, maintained by our considerate, friendly, and respectful employees. We also aim to provide a large, cost-effective selection of materials in one place to simplify your yard care experience. We hope to help you build and beautify your community just “one yard” at a time. We established Sandee’s Soil & Rock in 2001 to provide a convenient service that would meet the needs of those everyday homeowners who wanted just “a little bit” of topsoil, gravel, sand, etc.. We started small with only 6 products and 1 dump truck for deliveries when needed, but today we have expanded to provide more than 40 products, including our “you-haul concrete” that we make on site for you to pick up. This place rocks! They have the best products around and carry organic top soil that is out of this world. I have used their soil on all of my garden and even though I have a short growing season I have had excellent crops every year since I found Sandee's. Organic mulch. It's easy in-we brought our own truck and they loaded it right up for us. The quality looks good and hopefully it will lead to a great garden. My husband has his eye on a few of their rock and other landscaping materials. We were very pleased with the product and service we received. They were there to deliver within two hours of ordering. I have used Sandee's in the past and was very happy with everything. Great place for big boulders. Went there to find some boulders for a landscaping project. Great selection and not a bad price. The staff is super helpful as well. Excellent place for landscaping materials with friendly great service.